Examples: John Wayne (Roy Rogers, Gene Autry, B-westerns, B-movie serials, Fox's Charlie Chan mysteries, Monogram's Bowery Boys comedies, and Universal's Ma and Pa Kettle and Sherlock Holmes, The Ghost of Frankenstein (1942), a typical low-budget, sci-fi B-movies of the 50s - The Beast with 1,000,000 Eyes (1955), and Teenagers From Outer Space (1959); also Edgar G. Ulmer's Detour (1945). backdrop refers to a large photographic backing or painting for the background of a scene (e.g., a view seen outside a window, a landscape scene, mountains, etc. ), usually painted on flats (composed of plywood or cloth); a large curved backdrop (often representing the sky) is known as a cyclorama; backdrops were more commonly used before the current trend toward on-location shooting and the use of bluescreens. Example: although filmed on location in Mexico, most of the night scenes in The Treasure of the Sierra Madre (1948) were filmed on a studio set, with backdrops or flats. background refers to anything occuring in a rear plane of action (the background as opposed to the main action or attention in the foreground); abbreviated as b.g. background music refers to part of the score that accompanies a scene or action in a film, usually to establish a specific mood or enhance the emotion. back lot an undeveloped area, on studio property, in an open-air, outdoor space away from the studio stages, where real-life situations with backgrounds can be filmed; contrasted to on-location shoots that are more expensive; various studios in the Los Angeles area offer back lot tours. back projection a photographic technique whereby live action is filmed in front of a transparent screen onto which background action is projected. Back projection was often used to provide the special effect of motion in vehicles during dialogue scenes, but has become outmoded and replaced by bluescreen (or greenscreen) processing and traveling mattes; also known as rear projection or process photography (or shot); contrast to matte shot. Examples: Any film with a moving vehicle and back-projected street scenes viewed through the back or side windows, such as in To Catch a Thief (1955). banned the blocking of a film's release (in a theatre showing or on video) by either the government or an official movie classification board, for political, religious, sexual, or social reasons; see also censorship. 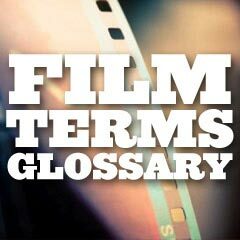 Examples: director Stanley Kubrick voluntarily banned his own film A Clockwork Orange (1971) in Britain for almost 30 years because of copy-cat violence. And recently, the Academy award-winning film The Tin Drum (1979) was seized and declared obscene by state law in Oklahoma. barn doors the black metal folding doors an all four sides of a light that can be bent back and forth on their hinges to control where the light is directed. barney a blanket placed over the film camera to reduce the amount of noise of the moving mechanisms inside; see also blimp. based on a true story films that consist of a story line that has at least some basis in real historical events, and may actually contain only a few factual elements. These films, loosely based on various biographies, stories, or events, may/may not significantly alter the characters or situations for greater dramatic effect; inspired by a true story indicates the film is even looser with the factual basis of the events. Examples: Braveheart (1995) (an account of the life of medieval Scottish patriot William Wallace), Raging Bull (1980) (based on the life of middleweight boxer Jake LaMotta), and Erin Brockovich (2000) (with Julia Roberts as the crusading single mother) shown here. behind the scenes the off-camera events or circumstances during filmmaking. Example: The documentary Hearts of Darkness: A Filmmaker's Apocalypse (1991) chronicled the sensational, behind-the scenes circumstances during the making of Francis Ford Coppola's Apocalypse Now (1979). beta 1/2 inch videotape that was originally called Betamax. billing the placement or display of names of actors, directors, and producers for a movie in publicity materials, opening (or closing) film credits, and on theatre marquees. A person's status is indicated by the size, relative position, and placement of their name. Generally, higher positions closer to the top with larger and more prominent letters designate higher importance and greater box-office draw, and precede people of lesser importance; the most prominent actor that appears first is said to have top billing, followed by second billing, and so forth. Example: Notice top billing given to Steve McQueen in Hell is for Heroes (1962). (or biographic) a biographical film of the life of a famous personality or historical figure, particularly popularized by Warner Bros. in the 1930s; a sub-genre of drama and epic films. Examples: The Story of Louis Pasteur (1936), or The Life of Emile Zola (1937), or the modern day Coal Miner's Daughter (1980) about Loretta Lynn. (or bit player) a small acting role (usually only one scene, such as a waiter) with very few lines or acting; contrast to a cameo, extra, or walk-on role. Example: Roger Corman making a brief appearance in The Godfather, Part II (1974) at the head table at Michael Corleone's Senate hearings. biz in shorthand, refers to the "business", or "show business". simply means without color; before the invention of color film stock, all films were black and white; monochrome (literally meaning "one color") usually refers to a film shot in black and white, although it can refer to a film shot in shades of one color; grainy B&W is often used to convey authenticity; abbreviated as BW, B/W, and B&W; contrast to color. Example: For artistic reasons, Peter Bogdanovich's The Last Picture Show (1971) was purposely made in B&W. Examples: Hitchcock's The Trouble With Harry (1955), Dr. Strangelove, Or: How I Learned to Stop Worrying and Love the Bomb (1964), The Loved One (1965), Robert Altman's M*A*S*H (1970), Harold and Maude (1972), Monty Python and the Holy Grail (1975), Whatever Happened to Baby Jane? (1962), Prizzi's Honor (1985), Heathers (1989), and Fargo (1996).